A damaged or worn valve assembly will prevent a pump from pumping effectively, however it is a very simple procedure to replace. 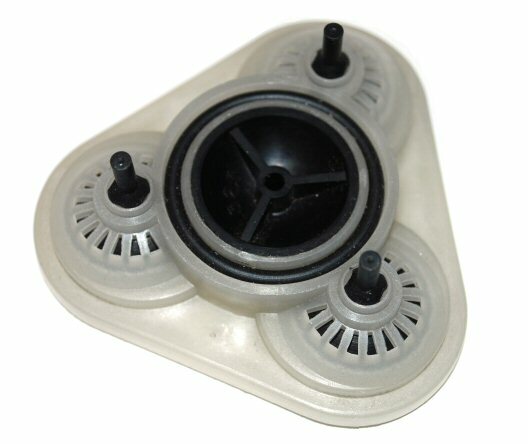 With a worn or damaged valve assembly the pump will appear to run normally but will not pump water or very little. These symptoms could also indicate an air lock or debris in the pump. Always ensure there is a good flow of water to the inlet of the pump and inspect the diaphragm and valve assembly first for debris. To access the diaphragm and valve assembly on our Shurflo pump the six ‘outer’ screws are removed and the black plastic head of the pump is then lifted away. Inside you will see the valve assembly as in the picture which can then be carefully pulled out and inspected. Please note that even the smallest amount of debris should be rinsed away under a tap. IP56 rated grey battery box as used on our original Pure Freedom water fed pole trolleys.